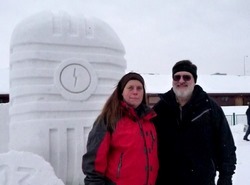 Suzi and Rich McClear pose in front of the KNBA snow sculpture (a giant microphone!) at the Anchorage Fur Rondy. Rich McClear was general manager, first of KTOO-FM in Juneau, and then of KCAW-FM Sitka, from before the station’s sign on in 1982, until 1993. He and his wife, Suzi, have continued to work abroad developing community radio stations and training journalists in eastern Europe and the Balkans. In a three-part interview with KCAW’s Robert Woolsey, the McClears reflect on the circumstances that helped shape Raven Radio, and consider the future of community radio in the age of social media. Part I (8:00) – The early idea that community radio might revolutionize communication. It didn’t quite work out that way, but the results were significant nonetheless. https://www.kcaw.org/wp-content/uploads/2012/03/MCCLEARX1.mp3 Click here for iFriendly audio. Part II (11:10) – Why Raven Radio? The McClears had options for broadcasting work at the national level, but chose Alaska instead. They still think it was the right choice. https://www.kcaw.org/wp-content/uploads/2012/03/MCCLEARX2.mp3 Click here for iFriendly audio. Part III (9:39) – Edginess, politics, and balance during the APC mill years. The future of community radio in social media. https://www.kcaw.org/wp-content/uploads/2012/03/MCCLEARX31.mp3 Click here for iFriendly audio.